Chargrilled lamb with labneh, pomegranate and fresh mint leaves. 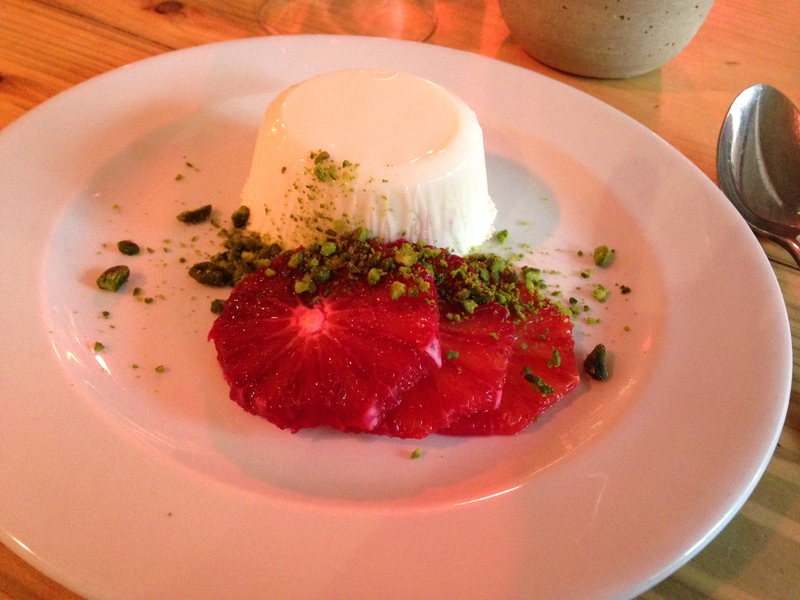 Panna Cotta with Orange Blossom, Blood Oranges and Pistachio. Butterscotch pudding with pear, wet walnuts and apple oil. It’s difficult to keep up with all the hot new openings in London – Over in “W1” everyone is loving Primeur, which I only just managed to book partly because they only accept “face to face” or Twitter bookings, consequently I was the only white haired woman in a room full of hipsters. The menu, on a blackboard, changes every day with lots of tempting seasonal choices, as does the wine list, carefully selected natural wines and a couple of excellent orange wines, including Sofia. It’s also jolly difficult to find, it’s out in Highbury, in the old Barnes Motors Building but it’s definitely worth the schlep. Rawduck in Hackney is also back on form and our lunch there was some of the best food we ate in London on this research trip. They have also revived an old tradition and are making a range of shrubs – drinking vinegars and an intriguing range of pickles and fermented foods. There are lots of recipes for “shrubs” on the internet, we’re experimenting at the moment and I’ll keep you posted. We loved their home made burger with sauerkraut slaw and hand-cut chips. 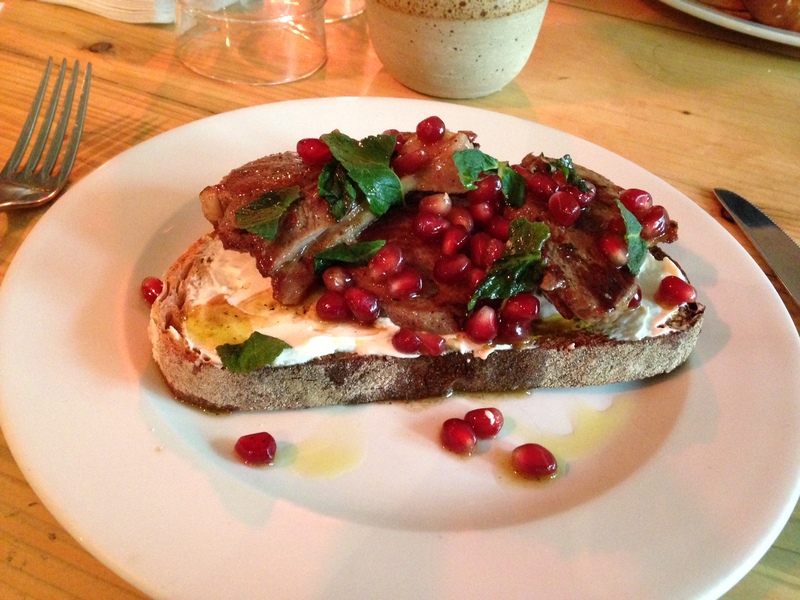 The lamb on grilled bread with labneh, pomegranate and mint was also terrifically good as was the milk pudding with blood orange and pistachio nuts. Rawduck is a sister restaurant of Ducksoup in Dean Street, Soho, definitely another contender for your London List. Delicious small plates – no desserts but you can nip across the road to Quo Vadis where the irrepressible Jeremy Lee makes some of the very best puds in London. I know you’re over sticky toffee pudding but you mustn’t miss Jeremy’s sublime version made with muscovado sugar and oh! the bread and butter pudding and home-made coffee ice-cream…. Honey & Co has been around for a couple of years now, another one of those tiny London restaurants run by passionate young people. This time it’s Sarit Packer and Itamar Srulovich who cook beautiful Middle Eastern inspired food. Don’t miss their cookery demonstration during the Kerrygold Ballymaloe Literary Festival of Food and Wine see: www.litfest.ie. This time we stayed in the Marylebone Hotel in Welbeck Street just off Marylebone High Street, brilliantly central. The staff are exceptionally friendly and helpful and there is a nice Irish connection, it’s owned by the Doyle family and is run by Roddy McGrath. I also love the Broadway market in Hackney, particularly the newly established Netil market. Go hungry and order slow braised pork in a fluffy steamed boa bun or crispy wings with hot sauce from BAO in the corner to the left of the entrance. Several stalls sell excellent handmade work by local designers. While you are waiting and you will have to queue if you don’t go early – treat yourself to an aperol spritz from Lucky Chip, the best I’ve ever tasted even though it comes in a plastic glass. Great coffee too at Terrone & Co.
On Sunday, morning check out the Farmer’s Market behind Waitrose on Marylebone High Street – lots of really good produce, organic vegetables, pork pies, farmhouse cheese and raw milk. The Fromagerie is just beside you there on Moxon Street with great produce, phenomenal cheese and other special foodie treats. Ginger Pig butcher shop which specialises in well hung traditional breeds is just next door, the big fat chunky sausage rolls are the best you’ll ever taste and I also love the beef cheek terrine. For a great brunch, The Providores is just around the corner on Marylebone High Street, you might want to try their Turkish poached eggs. Brick Lane (in Bethnal Green) also comes alive on Saturday when most London markets pack up their stalls. It’s part flea market, part food market, antique and vintage shops and unique kitchen and house wares. The Sunday Colombia Road Flower Market is just a short walk away, one of the best places to go on a sunny Sunday morning and close to Spitalfields and trendy Shoreditch. Rice pudding is definitely having its moment. In three of the hottest restaurants in London, rice pudding featured on the dessert menu. We had a cracking good meal in the newly opened Portland Restaurant in Great Portland St. There too, Will Lander and Dan Morgenthau’s team served warm rice pudding with a little honey ice-cream and some Jersey cream melting into the centre – divine. Primeur served a similar combination. Also comforting and delicious was the Rawduck version – this time it was served with new season’s rhubarb which still had a slight crunch, this is just one of my favourite restaurants in the Hackney Shoreditch area. I’m also mad about Lyles and the cute little Violet Cake Cafe on Wilton Way. The craze for offal continues unabated, duck hearts seem to be everywhere, the brilliant cafe and wine bar, Toast out in East Dulwich served them on grilled bread with a herb salsa while John Doe, another hot new restaurant, in Notting Hill where it is all about fire, poached the duck hearts first and then chargrilled them before putting them onto chargrilled sourdough. Looks like the American hot chefs’ obsession of cooking over fire has hit London though not in the pure form of Etxebarri near Bilbao or Camino in Oakland where all the cooking is done on a bank of open fires at the end of the dining room. Finally, before I run out of space there are two other new hot spots that deserve a place on your London List, everyone I know is raving about Kitty Fishers in 10 Shepherds Market and The Smoking Goat in Denmark Street near Charing Cross serves a short Thai influenced menu, every morsel was delicious …enough for this week. labneh seasoned with salt and freshly ground black pepper and freshly roasted cumin. Chargrill the bread, spread a generous layer of well seasoned labneh on top. Cover with slices of the warm lamb and a sprinkling of pomegranate seeds. Put the freekeh into a saucepan with cold water, bring to the boil and simmer for 20 minutes – 1 hour, depending on your freekeh (some are broken grains, others whole). It should be soft but still slightly chewy. Drain, season with salt and drizzle with extra virgin olive oil and toss. Taste and correct the seasoning. Preheat the oven to 200°C. Divide the cauliflower into florets. Drizzle with extra virgin olive oil, season with salt and freshly ground black pepper. Roast for 15 minutes or until slightly caramelised at the edges. Meanwhile, whisk 6 tablespoons of extra virgin olive oil, 2 tablespoons of white wine vinegar and 1 teaspoon of turmeric and 2 teaspoons of honey in a bowl. Sprinkle over the warm freekeh and toss gently, mix with the cauliflower florets, and some of the pomegranate seeds, (save some for sprinkling). Season with salt and freshly ground black pepper and a few nigella seeds. To serve put a couple of tablespoons of the freekah and cauliflower salad on a plate. Sprinkle with chopped pistachios. Put a dollop of labneh or greek yogurt on top. Scatter a few more pomegranate seeds, pistachio nuts, a pinch of sumac and a few sprigs of dill over the labneh and serve ASAP. 6-8 moulds (3-4fl ozs/90-120ml) lightly brushed with non-scented oil – sunflower or arachide. Put the cream and milk into a heavy bottomed saucepan with the castor sugar. Put on a low heat and bring to the shivery stage. Meanwhile, sponge the gelatine in the water. Put the bowl in a saucepan of simmering water until the gelatine is dissolved. Add a little of the cream to the gelatine, then stir both mixtures together. Add the orange blossom water to taste then pour into the moulds. When cold, refrigerate (preferably overnight) until set. To serve, unmould the panna cotta onto a cold plate. 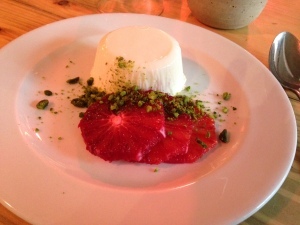 Sprinkle a line of chopped pistachios along the top between the orange and the panna cotta, serve. 125ml (4fl oz) apple juice and 50ml (2fl oz) extra virgin oil whisked together. Soak the dates in hot tea for 15 minutes. Line the bottom and sides of the cake tin with parchment paper. Cream together the butter and sugar until light and fluffy. Beat in the eggs, one at a time, and then fold in the sifted flour. Add the sieved bread soda, vanilla extract and coffee to the dates and tea, and then stir this into the mixture. Turn into the lined tin and cook for 1 to 1½ hours or until a skewer comes out clean. Put the butter and sugar into a heavy bottomed saucepan and melt gently on a low heat. Simmer for about 5 minutes, remove from the heat and gradually stir in the cream and the vanilla extract. Put back on the heat and stir for 2 or 3 minutes until the sauce is absolutely smooth. Arrange a square of pudding in a deep plate, spoon a little butterscotch sauce on top. Mix the pear and walnuts in a bowl, spoon a couple of tablespoons over top of the pudding. Whisk the apple juice with the oil and spoon around the edge. Serve ASAP! Pub Food for a New Era: We’ve visited some of the most successful gastro pubs in the UK, Ireland and beyond, and have so many delicious recipes and ideas to tempt your customers, and help you to turn a profit. On this intensive 2.5 day course we will show you a selection of traditional and modern pub food that can be produced in a small kitchen and ready at all times of day for when customers are looking for food. One of the highlights of the course is a presentation from respected restaurant adviser, Blathnaid Bergin, examining the all-important finances of beginning to serve food in your pub, so that you can avoid the common pit-falls of starting out in the food business. Wednesday April 8th 2015 see www.cookingisfun.ie. I just found two great new books on potatoes, The Irish Potato Recipe Book, written by Eleveen Coyle and published by Gill & Macmillan. This pocket guide has something for everyone with easy to follow recipes. Rich in vitamins, potassium and fibre, gluten-free and low in cholesterol, potatoes really are the perfect package. Eveleen includes tips on buying, storing and cooking perfect potatoes every time as well as a brief history of how Ireland’s synonymous relationship with the potato came about. The Potato Year by Lucy Madden, published by Mercier Press. Having moved from London in the 1970’s Lucy Madden began growing vegetables in the large Victorian walled garden of her home, Hilton Park Estate. She fell in love with potato growing and has developed a huge repertoire of culinary options with home-grown spuds. The Potato Year contains over 300 recipes for any occasion from traditional potato dishes to wild potato desserts, the perfect companion for anyone interested in knowing more about the most versatile and nourishing vegetable in Ireland. Get gardening, if you have not already done so it’s time to chit your potatoes (encouraging the seed potatoes to sprout before planting). Start about six weeks before you plan to plant out the potatoes.